We celebrated my mom’s birthday this past Saturday. It was a wonderful day of visiting with family and we had lots of delicious food. On Sunday I was a little tired and did not feel like doing a lot of cooking, so we had some of the leftovers from the birthday party. 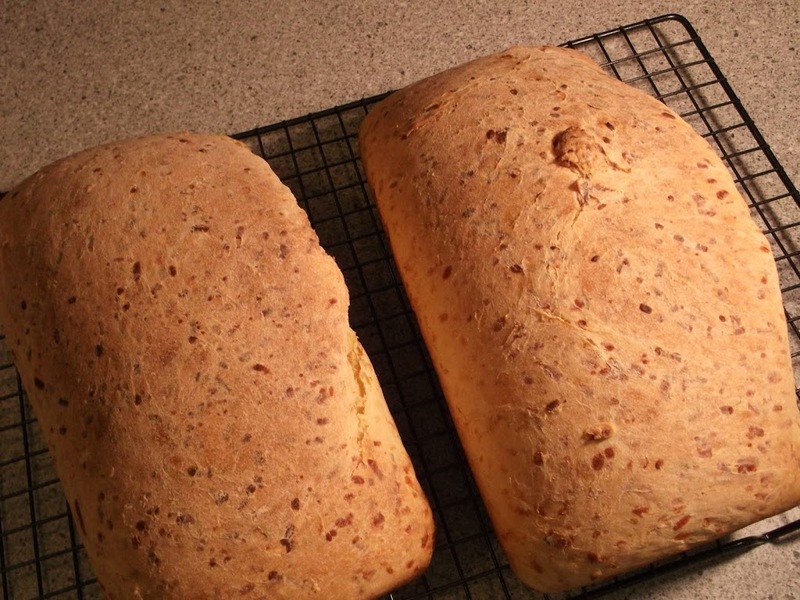 Although I did decide to make some bread to go along with the leftovers; I thought it would be nice to have something freshly baked to go with the meal. At my mom’s party I heard my sister talking about some cheesy biscuits that she likes to make and how delicious they are. I had that in the back of mind and was anxious to make some, but like I stated I was not too ambitious on Sunday. I decided that cheesy bread would be less time consuming and would probably be just as tasty. I found a recipe in my Joy of Cooking cookbook that sounded simple and delicious. The recipe suggested that you could add some herbs to the bread if you so desired. I really liked the idea of the cheese and herbs; I thought that it would give the bread a good flavor to it. 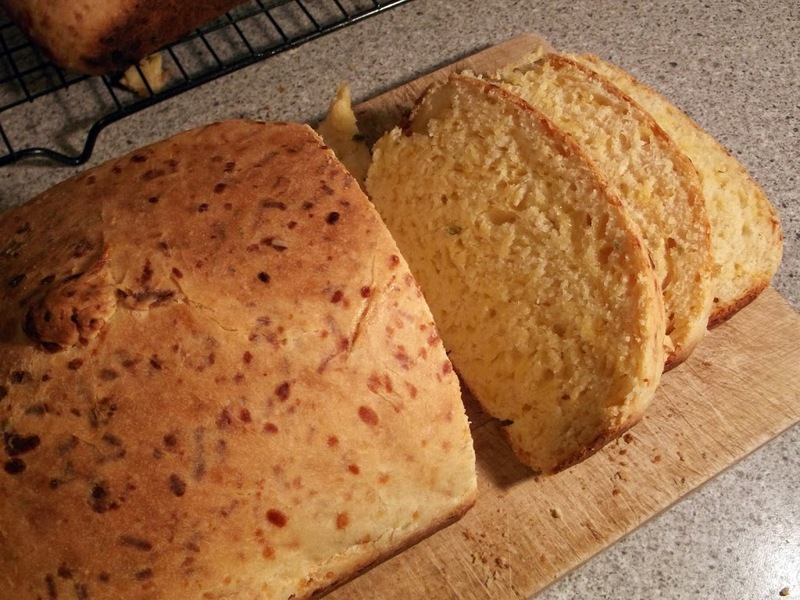 I had some dried chives which I chose to add to this bread along with cheddar cheese. Mike was a little skeptical about this bread; he told me later that he thought it would turn out to be a gooey mess. But he was pleasantly surprised, such as I was, the bread was absolutely delish! We are having friends over for dinner in a couple of weeks and I will be making this bread for them. I have decided to add the chives again, but will also add some minced garlic as well for a little more flavor. I can’t wait to make this bread for them. I hope that you will try this bread, it is truly yummy! Remove from the heat. Combine in a large bowl and let stand until the yeast is dissolved about 5 minutes. Knead the dough about 10 minutes. Transfer the bread to an oiled bowl and turn it to coat with oil. Cover loosely with plastic wrap and let rise in a warm place until doubled, about 1 hour. Grease two 9 x 5 inch loaf pans. Punch down the dough, divide it in half, and shape into 2 loaves. Place in the loaf pans and let rise again until nearly doubled, about an hour. Preheat the oven to 375 degrees F. Brush the loaves, if desired with melted butter. Bake about 30 minutes. Bake until the crust is golden brown and bottom sounds hollow when tapped. Remove from the pans to a rack to cool completely. Cookbooks notes: For variation, add a sprinkling of minced fresh or dried herbs, such as thyme or marjoram, with the cheese. You may also add chopped onions or garlic or minced scallions, pimientos, or green olives when you roll up the loaves. For a pleasant variation, use whole wheat flour for half of the white and 2 tablespoons honey instead of the sugar. Dawn’s notes: I used 2 cups of mild cheddar cheese and a teaspoon of dried chives. I have a feeling my entire family would gobble this bread right up! 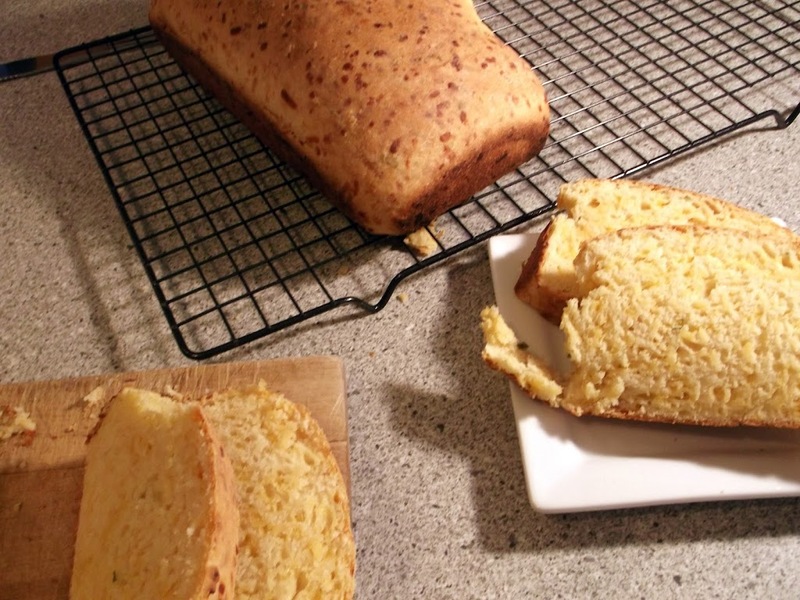 I just love homemade bread and cheese makes it even better! I have an award waiting for you on my blog. The cheese bread looks delicious! Lucky friends!